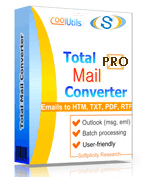 Total Mail Converter Pro converts MSG and EML to PDF, DOC, TXT, HTML, HTMLX, TIFF, RTF documents and images (TIFF, JPEG). 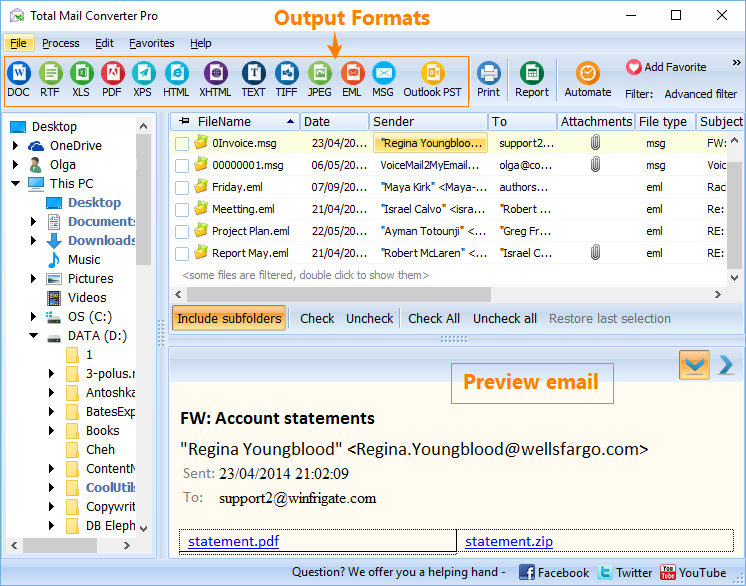 While other email converters only extract and save attached files in their original formats, the Pro version is unique - it converts attachments as well. For example, if you have an email with a doc attachment, Total Mail Converter Pro can convert both the message and the attachment to PDF as part of a single operation. Attachments saved in DOC, TXT, RTF, PDF, HTML, XLS, and OpenOffice formats can be converted to DOC, RTF, TXT, HTML, HTMLX, JPEG, TIFF, or PDF. With multi-page formats, you can combine several emails into one PDF, DOC or TIFF file. Rename output files using macros (name, date, sender, subject, etc.). Attachments can be given descriptive names as well. 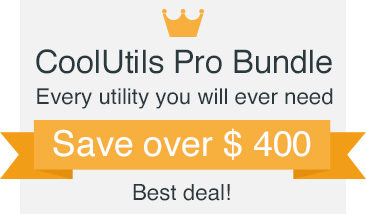 Find out how lawyers save hours with Total Mail Converter Pro. Control document appearance by fine-tuning your output files' display options; change the fonts, colors, styles and more. Alternately, you can choose to include any external CSS scheme. More unique options..
Total Mail Converter Pro is built around a powerful engine and was designed to help save hours if not days worth of time. It easily processes hundreds of thousands of MSG/EML files through its batch feature, and puts you in the driver's seat through a robust set of customization options. If you need a server version with ActiveX try Total Mail Converter ProX (this functionality can be easily integrated with your own app). Download your free evaluation copy today! Need someone to reach you with more info? Request a call back 1-855-418-2323. We are very happy with the Total Mail Converter. We used it to convert around 20 thousand mails to PDF, important for us was it's ability to convert mail attachments into the target PDF. On converting the 20 thousand mail, only around a dozen of them failed because of unreadable attachments. So here is our only suggestion for improvement: Once the conversion of a single attachment fails, don't skip the whole mail file but rather convert the other attachments and complete the PDF without the single faulty attachment. Keep up the good work." Total Mail Converter Pro converts EML, MSG, EMLX, MIM files to other file types in batches. Want to store attachments in the same file type? Only Total Mail Converter Pro can convert attached files to PDF, DOC and other formats together with email bodies. It's very handy to have all the data in one format. Want to migrate to Windows Live Mail, Outlook Express or any eml-based client? Convert MSG to EML with our app. Combine several emails into one multi-page PDF or TIFF or DOC file. If your emails have links to images in the web, you may want to exclude them from the output file. There is a special "not to access internet for images" option for you. 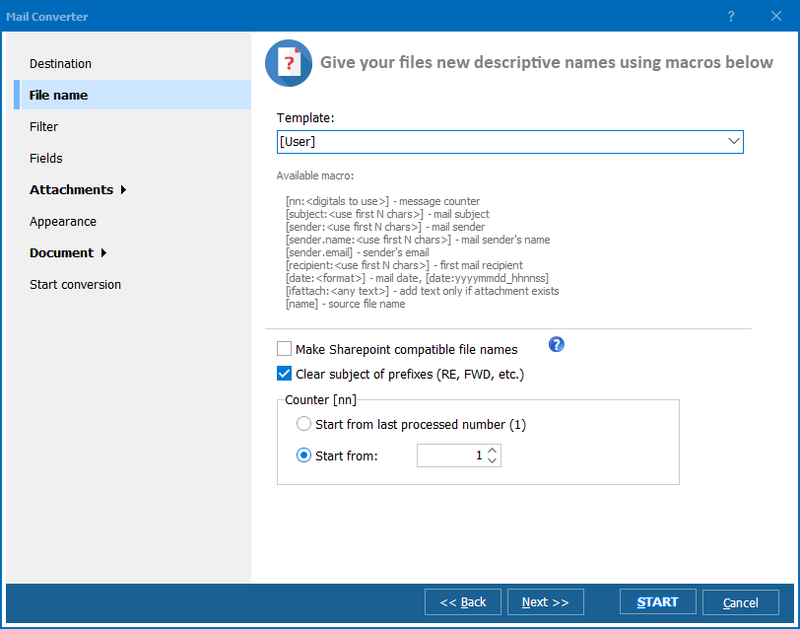 Rename your emails using any macros (file name, sender or even first document page number). 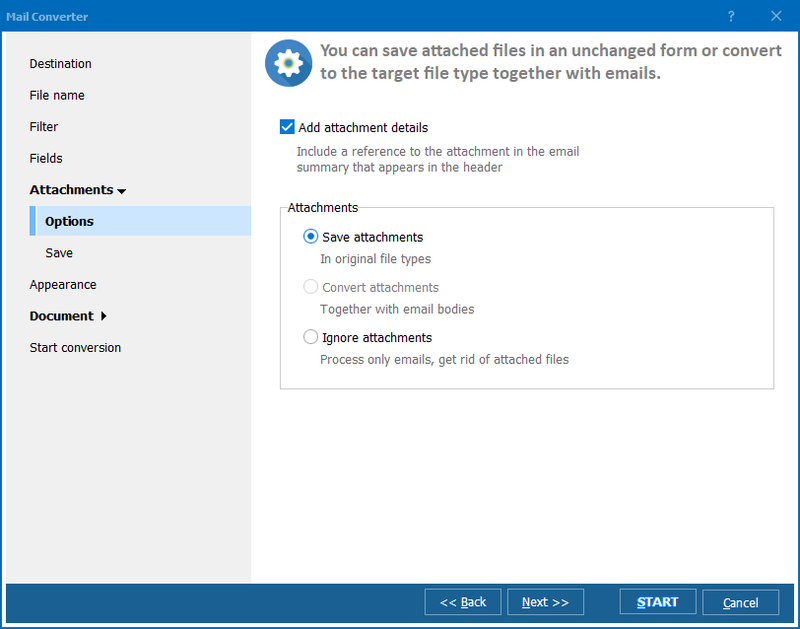 Attached files can also get new descriptive names so that you knew which attachment belongs to which email. With Total Mail Converter Pro you can tune the appearance of the output file with your CSS file or any external scheme. Total Mail Converter Pro has a clear, easy-to-follow interface. All settings are made step-by-step. You can always rely on default settings! Output file types include DOC, PDF, XPS, HTML, XHTML, TXT, TIFF, EML, MSG, PST! What is the best way to archive emails recieved from different time zones? To keep them in chronological order Total Mail Converter Pro may swap their dates to UTC (Coordinated Universal Time). All files in order! With Total Mail Converter Pro you can gather individual EML and MSG files into one PST for further import to Outlook. Preview each email to make sure it is what you need right inside the program. Unlike other email converters Total Mail Converter Pro can convert only those fields you tick (sender, recipient, subject, body, etc). Get rid of the info you don't need! Add page counters! The app can type any text to the footer or the header of the file (page numbers, dates, company's name, etc.) Choose the position, color and font. It works great for eDiscovery or any Freedom Of Information requests. When you convert MSG to PDF you can set user permissions or add your digital signature. Get PDF, PDF/A or non-searchable PDFs. Total Mail Converter Pro can be run via command line. You don't have to learn the params: make settings in GUI and get the ready-to-use command line. Total Mail Converter Pro is quite simple for new users. You select the folder with your emails, check those you want to process and press th etarget format button (PDF, DOC, TIFF, PST, etc). The default settings are good enough for most cases. However, you still have the power to change each of them. What embed attachmnet into the final PDF? Include the subject into the output file name? Add a counter? Use PDF/A instead of PDF? The built-in settings wizard will help you. The step by step inlays will guide you through the app's options. Input files: MSG, MIM, EML, EMLX.